Fleet Primary School in Camden won our autumn mural competition and we worked with Alessandra Tortone to bring the pupils sketches to life as a backdrop for Fleet’s new growing space this spring! The two days of painting were quite chilly (we even had to reschedule because of snow) but the pupils had a great time pitching in, mixing paints and bringing colour to their school ground. Big thanks to Alessandra and to Garden Organic for making this possible. 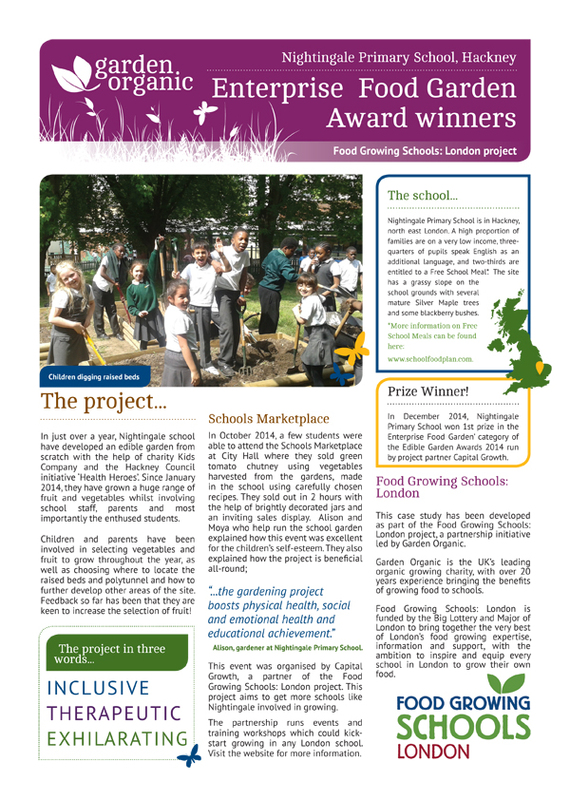 Discover more Food Growing Schools competitions here. See more of Alessandra Tortone’s work here. Food Growing Schools: London are inviting schools in Camden & Islington interested in food growing projects to a forum at Rhyl Primary School, Rhyl Street, NW5 3HB on Monday 20th June from 3.30 to 5.30pm. This forum is a chance to gain inspiration and ideas from another food growing school, share ideas and learn something new through a seasonal activity run by Food Growing Schools: London. We would also like these forums to act as a swap shop, so please bring along seeds, plants, tools and educational resources you would either like to share, give away or swap with other schools. There will also be plenty of free seeds and resources available from Food Growing Schools: London. Edible Playgrounds (EP), a project led by Trees for Cities (TfC), to provide schools in urban areas the opportunity to grow food in their playgrounds, today launches an edible playground in Carlton Primary School in Camden, London. EP benefits children’s health and education by offering those living in urban areas the opportunity to grow, harvest and eat good food, and integrate outdoor learning into the school curriculum. By transforming school grounds into fully functional food growing spaces, EP provides children the opportunity to be active outside – getting them excited about food growing and understanding where food comes from. Over the last six months, working in partnership with Carlton Primary, Trees for Cities designed and constructed an edible playground in the Camden school. The edible playground contains a greenhouse, vertical herb garden, wormery and vegetable beds, supporting the school to utilise its outdoor space as a learning resource. Michael Palin, Patron of Carlton Primary School, helped raise funds for the multi-sensory garden and officially opens the edible playground today. Governors, parents and children will attend the opening and explore the garden for the first time. Michael Palin said: I’m so pleased that Carlton School has been chosen to take part in the Edible Playgrounds project. It will give the children here, in the middle of a busy city, the chance to learn how food is grown and to help grow it for themselves”. Trees for Cities has been working in schools to plant fruit and nut trees since 2000. With this track record and experience, TfC’ technical expertise in the delivery of Edible Playgrounds and operations is well established and highly regarded. The first Edible Playground was created in 2003. There are currently over 25 Edible Playgrounds in the UK with a further 50 to be rolled out over the next three years. The project has also been supported by City Bridge Trust, Mayor of London, Ernest Cook Trust, Volunteer Centre Camden, Ernest Cook Trust. The RHS Campaign for School Gardening has partnered with the UK Space Agency to embark on an ‘out of this world’ educational project. The project, Rocket Science, will give around half a million UK children the chance to learn how science in space contributes to our knowledge of life on earth, using the invaluable expertise of the European Space Agency (ESA) and RHS Science team. Two kilograms of rocket seeds will shortly take off from Florida bound for the International Space Station as part of British ESA astronaut Tim Peake’s six-month Principia mission. After several months on board, the seeds will return to land in the Pacific Ocean in the spring of 2016. After return to the UK, they will be packaged up with identical seeds that have stayed on earth. Participating schools will each receive two packets of 100 seeds to grow and compare, and a collection of fun and inspiring curriculum linked teaching resources and posters, tailored according to the age of your pupils (Key Stages 1 and 2 or Key Stages 3,4 and 5). Schools that register their interest will be the first to know when official applications for the seeds open. Edible Playgrounds (EP), a project led by Trees for Cities (TfC), to provide schools in urban areas the opportunity to grow food in their playgrounds, is launching an edible playground in Carlton Primary School in Camden, London. Michael Palin, Patron of Carlton Primary School, helped raise funds for the multi-sensory garden and officially opens the edible playground on 19th May. Governors, parents and children will attend the opening and explore the garden for the first time. Email info@edibleplaygrounds.org if you would like to attend the opening and if you are interested in an interview with Sharon Johnson, CEO of Trees for Cities. A photo-call with Michael Palin at the Edible Playground is at 2.00pm, please confirm attendance. This project allows children from 16 schools to sell food they have grown at school at Borough Market, the proceeds of any sale going to the charity Fareshare. May sees the project get started, with Fareshare running assemblies at the schools to introduce the programme, followed by training at Borough Market itself on 14th May 2015. This training will include a hands on gardening tutorial run by TV gardener Chris Collins and a talk about Market trading by some of the stall holders at Borough Market. Over the course of the project, schools will also visit Fareshare to see where the money they will raise is put to use, as well as a visit to the schools by a gardener to see how their growing is going. The project culminates in two sales days, with half the schools selling their produce on the summer sale on the 2nd July and the other half at the harvest sale in September. Young Marketeers. We are starting our great Schools to Market with Whole Foods programme in May, with 36 schools involved across the country. We are now in the third year of this great project and over the this term schools involved will have an assembly run by Whole Foods at their school, a jam and chutney making masterclass by a chef, a visit to a farm and a marketing workshop with Whole Foods. This will culminate in Schools to Market Day in September, where the children sell jams and chutneys they have grown, made and marketed! The purpose of the programme is to teach children all about the value of food and where it comes from. Schools to Market.